CDC’s Injury Center encourages you to promote safe, stable, nurturing relationships and environments to prevent child abuse and neglect. While the true number of victims is likely much higher, the National Survey of Children’s Exposure to Violence estimated 1 in 4 children have experienced abuse or neglect at some point in their lives, and 1 in 7 children had such experiences in the last year. Child maltreatment includes all types of abuse and neglect of a child by a parent, caregiver, or another person in a custodial role that results in harm, potential for harm or threat of harm to a child. The effects of abuse and neglect continue throughout the life course, with child abuse and neglect costing an estimated $124 billion per year in total lifetime costs. 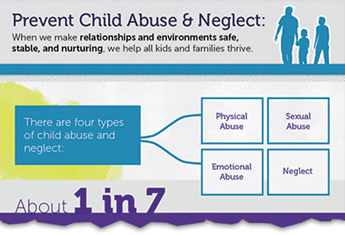 The good news is that child abuse and neglect is preventable. Research suggests that comprehensive strategies that promote safe, stable, nurturing relationships and environments for all children and their families are key in preventing child abuse and neglect. The technical package is intended as a resource to guide and inform prevention decision making in communities and states so that every child has safe, stable, nurturing relationships and environments.